Unfinished academic study showing a plan for a building with a three-bay pilastered portico on steps, with staircases on either side entering an apsidal-ended hall with two screened alcoves, and additional halls. 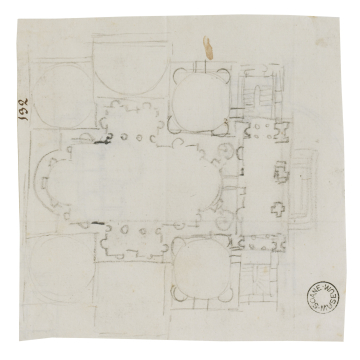 You are here: CollectionsOnline / Unfinished academic study showing a plan for a building with a three-bay pilastered portico on steps, with staircases on either side entering an apsidal-ended hall with two screened alcoves, and additional halls. Two unfinished plans in black chalk of symmetrical buildings with circular halls; they may be related to the composition on the recto.